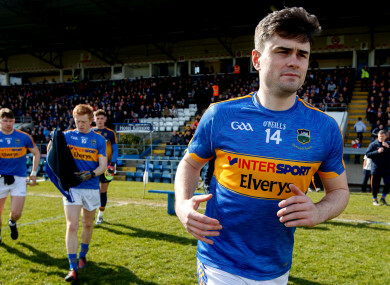 Michael Quinlivan became Tipperary's second ever All-Star winner in 2016. TIPPERARY’S HOPES OF staying in Division 2 of the Allianz football league have suffered another blow with former All-Star Michael Quinlivan ruled out for most of the campaign. The Clonmel Commercials club man has undergone surgery for a knee cartilage problem and is set for five or six weeks on the sideline. It is the latest in a series of injury set-backs for manager Liam Kearns with goalkeeper Evan Comerford also doubtful after coming off late in Sunday’s 2-5 apiece draw with Fermanagh. Kearns is hopeful that Quinlivan, who became Tipperary’s second ever All-Star footballer when he was honoured in 2016, will be back for the concluding stages of the league. “There are no easy games in this division and they keep coming. We have nine players out and it looks like Evan Comerford is in big trouble now as well. I think it’s his quad, groin or both, so he’ll be out for a while,” said Kearns. Tipperary, promoted to Division 2 for last season after Quinlivan hit a hat-trick against Armagh the previous year, are currently bottom of the table on points difference. Tipperary, like Cork and Clare, have just a point from their two opening games and with last year’s captain Robbie Kiely missing the league through travelling, Kearns can do with a break or two on the injury front as leaders Donegal come to Semple Stadium next Sunday. “Robbie Kiely won’t be back, Bill Maher and Shane O’Connell will be lucky to make any of the league, don’t know now what the story is with Evan Comerford. “Paudie Maher is closer to returning but Liam Boland is out now for a long time. Nine players out injured, that’s the way it is and we’re not going to be getting too many of them back,” added Kearns. Email “Knee surgery sidelines 2016 All-Star as Tipperary's football injury problems continue to mount”. Feedback on “Knee surgery sidelines 2016 All-Star as Tipperary's football injury problems continue to mount”.